The valve body was successfully analyzed to measure the stress concentration across the geometry considering three different operating pressure conditions. The results showed excessive stress concentration at the tip of the ribs compared to other regions. It was suggested to modify the rib design, in order to compensate stress levels. The valve body acts as a platform to mount all the components of an air drying unit. Consisting of inlet and outlet ports, the valve body has to accommodate high pressurized air, which often generates stresses that may lead to deformation. 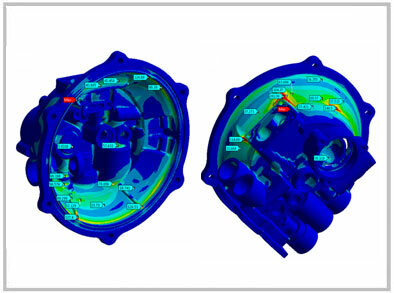 India based auto parts manufacturer utilized Hi-Tech’s computer aided engineering expertise to evaluate the valve body design for structural integrity under different loading conditions. The client’s prime concern was to identify stress concentration regions and find ways to eliminate them. The valve body was required to be first accurately modeled using CAD tools in order ensure meaningful results. The following application of boundary conditions and different loading scenarios were used as an input to execute structural analysis using finite element method. The results obtained through the analysis showed that stress across the component geometry was well within the permissible range. However, a high stress concentration was observed at the tip of the ribs, suggesting design change. 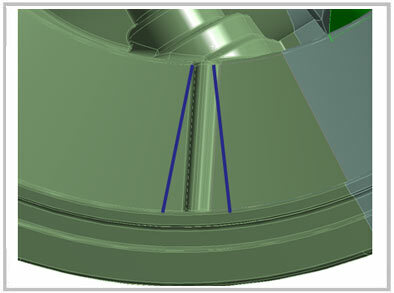 Hi-Tech’s engineering team suggested to improve the rib design with tapered structure, in order to compensate the stress levels and subsequently minimize deformation.